Dianne Blazer has two main passions: hockey and stained glass. She's been a lifelong hockey fan and has adopted the Vegas Golden Knights as her team since moving to Las Vegas a year and a half ago. Twice a week she spends her days at the Sun City Summerlin Mountain Shadows Community Center, creating stained glass art. She started as a hobbyist 15 years ago but now she says it's a full-fledged passion. "When I discovered I could do it, it woke up this passion," said Blazer. Recently, her daughter and son-in-law asked her to create a Vegas Golden Knights-themed work for their home. "Of course I can't say no to my kids," said Blazer. So she got to work making an alt logo pattern and spent 12 hours tracing, cutting, grinding and carefully placing each individual piece of glass. From start to finish, it was a labor of love. "It makes them smile every time they see it. They're proud of their mom," said Blazer. 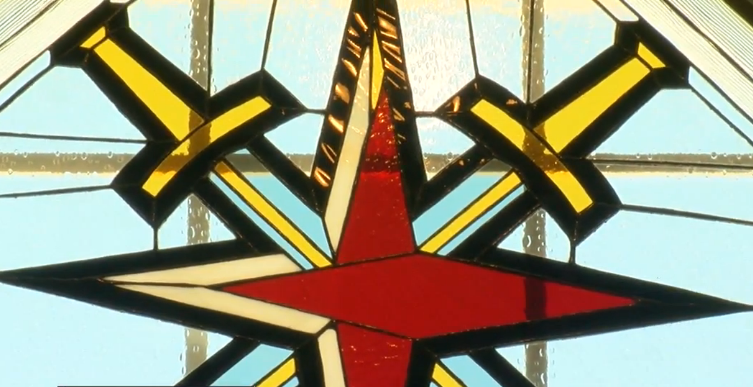 The piece was placed in an octagonal window halfway up their staircase. "Having it be one of the first things I see when I wake up, the sun coming through it, it's amazing," said Jennifer Hardin, Blazer's daughter. And although Blazer said she created the piece mostly out of the kindness of her heart, she is hoping for a little something in return. She's never been to a VGK home game and hopes her daughter or son-in-law will take her as a thank you. "The glass might do it, might seal it," Hardin joked. If you're interested in commissioning a piece of stained glass from Blazer she is accepting email .